Bannga is a Banana and Gingerbread Custard. Warm Gingerbread with a ripe banana and vanilla custard. Blue Doh – The fluffiest, fresh Donut filled with a Blueberry Jam and Cream Frosting. Fills the room with an amazing donut aroma. kaveman is known for his chocolate vapes. Well here is his Mint Choc Chip…NAILED! What can we say. You’ll need to ask kaveman the story behind this one. A rich milk chocolate with a cappucino hit and topped with whipped cream. We urge you to try this and can’t wait for your feedback! Fresh pink and green Guava’s blended with Lime and finished with a candy balance. If your looking for your summer vape, Go Go Gadget, Go Go Guava. Another one added to our summer collection. A nice juice red grape with hints of soda and other secret bits and bobs. If you love grape, you will be Grr..Ape after this! Is a fresh fruity blend based on Sweet and Sour Lychee, Lemonade and a little fizz and mint to wrap it all up! A great refreshing summer vape. It took a fair few bottles of research to get this right! Sour Green Apple Candy which has the perfect tangy taste. It’s sweet, it’s fruity and it’s sooo moreish! Everyone loves a good Strawberry juice. 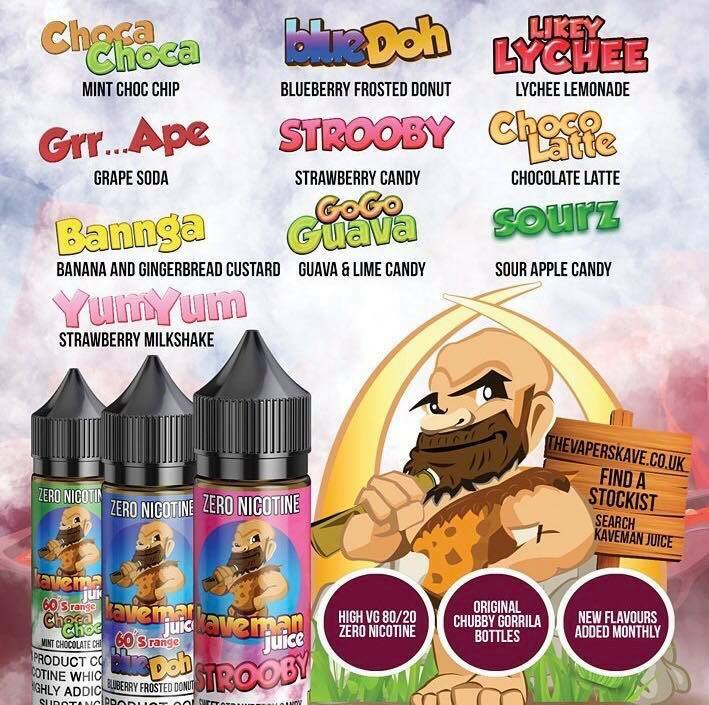 Our Strooby is a fruity, sweet Strawberry chewy candy which is a perfect all day vape! kaveman has kept this sweet and simple but it’s oozes creaminess and even has that little malted milk feel. Strawberries blitzed with Cornish Vanilla Ice Cream and topped with fresh cream and strawberries. A lush milkshake vape thats fruity on the inhale and creamy on the exhale. Hi, this is UK Vape Deals, no catch, please feel free to join our group with 40k members and ask in there. This is a website where the public find deals on various websites. It actually works out at £20.03 when you factor in nic shots and 2nd class delivery.